3. Wet your hand and wipe across the salmon to clean. Never place fish in water. 4. Rub the Toasted Sesame Oil on the Salmon, enough to cover fish. If fish does not have the skin, oil both sides. 5. Lightly sprinkle the Lemon Pepper, Italian, Cajun, Dill and Mustard seasonings on upper side of Salmon. 6. If you like, slice the lemon thin and place two to three slices on the Salmon (depending on size). 7. When plank is soaked and grill is ready, wipe excess water from plank. 8. Rub a teaspoon of Olive oil on plank. 9. Place salmon skin side down on plank. If your Salmon has no skin, place none seasoned side down. 10. Place the plank on the center of grill and close lid. Keep the lid closed as much as possible to allow for faster cooking of the food. 11. Cook for 12-18 minutes depending on size/thickness of cut. 12. Place on serving platter or leave on plank. 13. Careful, be sure to use a spatula,the plank will be hot! I lived in Seattle, Wa for over 15 years. In that time, I experimented looking for the best Salmon recipe. After about 5 years I perfected it. Nothing came close to my Salmon and even people that did not like fish, loved my Salmon. 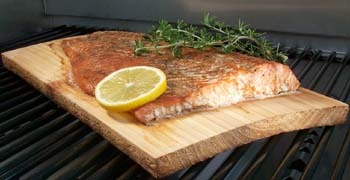 Recently I discovered cooking Salmon on a Cedar Cooking Plank. Now, I'd say that just about anyone can make great tasting Salmon the first time, every time. Why is this? It is mainly because of the moisture that is in the cedar plank. The soaked plank releases moisture as it heats up. The moisture envelopes and is absorbed by the Salmon along with a subtle cedar flavor. The heat also dries the wood slowly causing it to smoke slightly to add a subtle smoky taste as well. Because of the moisture, the Salmon (and almost any meat or vegetable) cooks more evenly staying moist. When the Salmon (and other foods) is placed directly on the grill, it will dry out faster causing especially fish to cook unevenly and over cook if not attended to constantly. You may have a 30 - 45 second window of time between a perfectly done piece of fish and a dried out tasteless failure. With the soaked cedar plank, you have more like a 3-5 minute window. The last time I made Cedar Plank Salmon using my charcoal grill, I did not put enough coals in and I was loosing heat toward the end, at about the 13 minute mark. I wanted to check the Salmon to see how it was doing, so I just got out a table knife and made a cut in the Salmon along the grain of the fish in the middle at the thickest part. I saw that it was a little rare so I knew to give it another 5-7 minutes. It turned out perfect. Here again, because of the moisture, it was evenly cooked and the wound where I cut it was healed from the moisture. My wife even commented that it was the best I had ever made, ever. Friday I had to go to Costco to pick up some odds and ends and when I walked past the seafood section I noticed they had some real nice Tuna. I love sushi, so when I see good quality Tuna I like to just sear it lightly on both sides and eat it that way. I picked up a package that had two nice size pecies in it. That night I seared one of the pieces and my wife and I had it with a salad. Today for lunch I wanted something different so I got one of my 6 inch Cedar Cooking Planks that I keep in my freezer and throw the other piece of Tuna on the grill. Here is a very quick lunch or dinner. ( I have a very small grill so it only takes about 5-10 minutes for the grill to preheat). 3. Wet your hand and wipe across the Tuna to clean it. Never place fish in water. 4. Grind pepper on the Tuna to taste. 5. Place Tuna on smooth side of plank. 6. Place the plank on the center of grill and close lid. Keep the lid closed as much as possible to allow for faster cooking of the food. 7. Cook for 8-13 minutes depending on size/thickness of cut and desired rareness. If you like your Tuna less rare, turn the Tuna over at 6 minutes. 8. Place on serving platter or leave on plank. 9. Careful, be sure to use a spatula,the plank will be hot! You can add more or different seasonings to taste. Experiment, cooking on cedar is very versatile, fun and always gives you a new taste sensation.